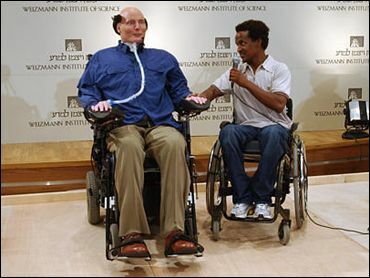 Actor Christopher Reeve told an Israeli audience he thinks there is a good chance he will walk again — provided "politics and religion" don't interfere with scientific research. The "Superman" star, who has been paralyzed from the neck down since an equestrian accident in 1995, is on a five-day visit to Israel, visiting research facilities and hospitals to study advances in treatment for spinal cord injuries. One of the most moving moments of Reeve's visit was his meeting with an Israeli youth paralyzed in a suicide bombing. "Welcome to Israel," 25-year-old Elad Wassa said. "You are my hero." The youth had written a letter to Reeve, who was so moved that he had to meet him. "This young man is incredible," the actor said. "It's so great to be together with him." Speaking to journalists at the Weizmann Institute of Science in the city of Rehovot, near Tel Aviv, Reeve said progress on research required international collaboration, but was being slowed by disputes over intellectual property rights and widely varying rules on stem cell research. Many scientists believe stem cells from human embryos could be used to treat a vast array of conditions, from spinal injury to diabetes and Parkinson's disease. Israel is a leader in the field of spinal injury treatment and in stem cell research, which has been limited in some countries because obtaining the cells involves destroying a human embryo. The U.S. government has limited stem cell research because of the embryo issue. Reeve has been critical of U.S. policy. "My hopes are that politics and religion will not interfere with progress for a cure," Reeve said Tuesday. "If those problems are overcome, I stand a good chance of walking."